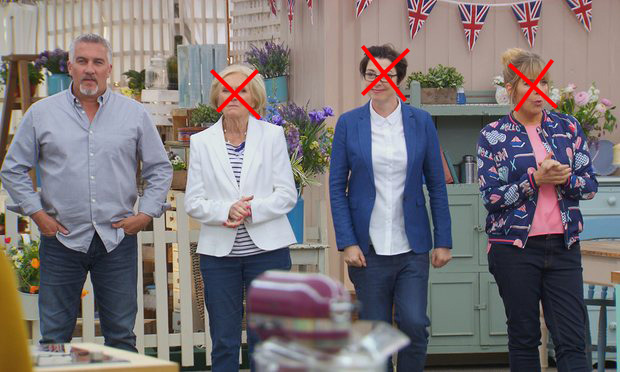 With Sue Perkins, Mel Giedroyc and Mary Berry all leaving the Great British Bake Off after BBC announced the show would be moving channels, Channel 4 no doubt had to fork out a lot of cash to keep Paul Hollywood as a host. And fork out a lot of cash, they did. The BBC baking show was bought by Channel 4 earlier this month when they outbid the BBC’s reported offer of £15 million per year to keep the programme. The Sky-owned production company Love Productions was reported to have refused to entertain any offers under £25m a year, leading to the show’s move to Channel 4, Indy100 reports. Because no other hosts have been chosen, Channel 4 has effectively paid £25 million for the world’s most expensive marquee and one judge, Paul Hollywood. I am delighted that I will be continuing as a judge when Bake Off moves to Channel 4. I want to thank the BBC and Mel and Sue for making my time in the tent great fun and really rewarding. He also forgot to mention Mary Berry. Which is a little awkward. Will people still watch GBBO? Probably. Will it be as good as the BBC original? Given what has happened to shows like Top Gear after switching hosts, probably not.